Young director Niroshan Illeperuma who had been an active member in the local entertainment scene began work in his maiden teledrama Sihina Aran Enna. The team marked the event with a colourful muhurath at Hotel Taj Samudra recently. The story rotates around a girl suffering from poverty. Though she looks after her brother and sister while facing the wrath of her father, the girl has big plans for her future. She vies to become a film star and never falters in pursuing her dreams. The celebrity world was noting like what she had imagined. She faces many hurdles and unfortunate incidents on the way to fame. Her dedication wins over the hearts of millions of fans but nobody knows of her inner suffering. This is basically an outline of what Sihina Aran Enna has in store for you. 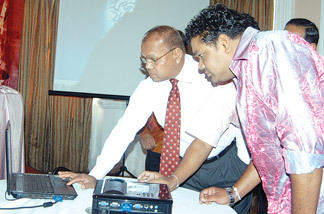 www.sihinaaranenna.com was also launched at the event. Sihina Aran Enna stars Chathurika Piries in the lead role with Roshan Pilapitiya and Bimal Jayakody portraying significant characters. A unique feature of the website is that all the news related to the teledrama will be uploaded from the time it begins shooting. Fans will be able to see the making of the teledrama, get the latest news in connection with it and even watch the episodes online. There will also be competitions which will help them win valuable gifts. Sihina Aran Enna will be the first local teledrama which can be viewed on the website itself. The website was designed by enspirer. The script is by Aruna Premaratne while Priyantha Pradeep is the cameraman. Nadeeka Guruge composed the music. Indika Udara Lanka is the make up artist of the project. The art director is Suranga Gunatileke, assistant director Newton Gunasekara, publicity plan by Sanjaya Aapa Senivaratne and media coordination by H M Sugath. Shooting will take place at the Mahinda Rajapaksa Tele Cinema Village in Ranmihitenna. The teledrama will be produced by Jayantha Piries on behalf of Roshan-Chathurika’s Chala Roo Nirmana productions.